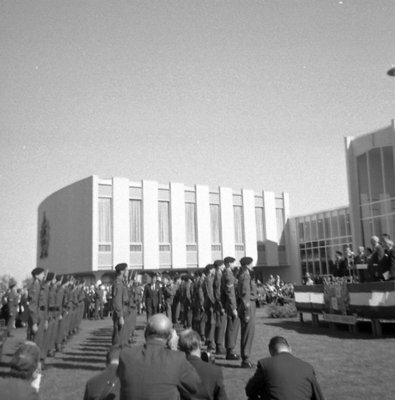 A black and white photograph of Premier John P. Robarts inspecting an honour guard from the Ontario Regiment headed by Lieutenant Colonel James R. Warnica. Winter, Brian ; Robarts, Premier John P. ; Warnica, Lieutenant Colonel James R.
605 Rossland Road East, September 30, 1964, Brian Winter. Whitby Archives A2013_004_124.